Lucerne, 18th June 2014 - How did Switzerland, a country known for its Alps, become equally famous for its chocolate? This is a question that the Swiss Chocolate Adventure at the Swiss Museum of Transport seeks to answer. An attraction that's unique in Switzerland, the Swiss Chocolate Adventure offers a multimedia journey providing insights into the discovery, provenance, manufacture and transport of chocolate. Visitors, in the role of passengers, enter a lift in the form of a freight container. This takes them on a cargo ship to West Africa and one of the world's largest cocoa-growing areas. Panoramic screens in the container suggest the sea crossing and the arrival at the port. The Adventure presents the entire processing and transport chain from the cultivation of the cocoa bean, its transport to Switzerland, and the manufacture and sale of the end product. Seeing, hearing, tasting: this multimedia voyage of discovery appeals to a range of senses. Visitors are treated to four complementary thematic displays during the 25-minute or so journey. 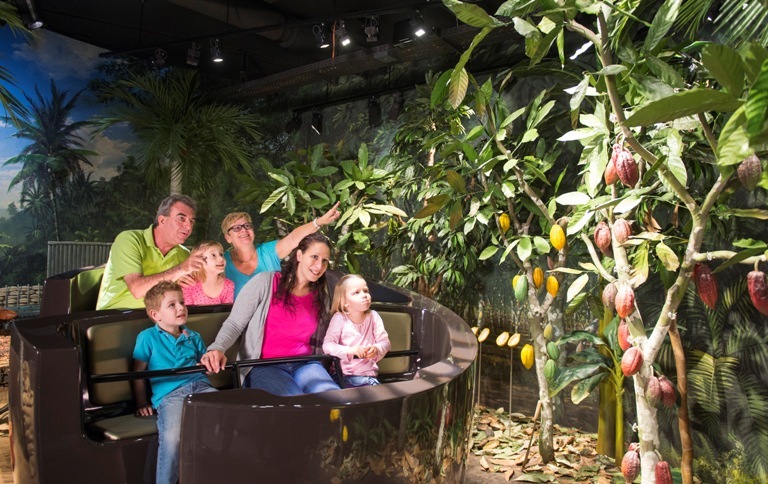 In the virgin forest they learn about the cultivation and harvesting of the cocoa bean, while in the Swissness Diorama they are presented Switzerland's agriculture, which delivers the other raw ingredients needed for production – milk and sugar. In the world of chocolate pioneers, visitors encounter those who dreamed up Switzerland's world-famous, melt-in-the-mouth chocolate products. They include François-Louis Cailler, Philippe Suchard, Daniel Peter, Rodolphe Lindt and Rudolf Sprüngli, whose entrepreneurial and inventive flair set milestones in the industry. The journey culminates with a box of pralines, which visitors are welcome to taste. Alongside the thematic displays are four industry professionals explaining their roles. They all have a hand in transforming the cocoa bean into the sensory experience that is chocolate: the cocoa administrator in Ghana, the buyer in Switzerland and the quality assurance specialist checking the cocoa beans on their arrival. Lastly the Master Chocolatier reveals which is his favourite chocolate and initiates visitors into the secrets of chocolate making. The Swiss Chocolate Adventure is a product of a collaboration between the Lindt Chocolate Competence Foundation and the Swiss Museum of Transport. Both institutions reflect typical values of Swissness such as tradition, pioneering spirit and innovativeness and, as such, contribute to strengthening 'brand Switzerland'. Together they are seeking to forge links between two themes: chocolate as a quality Swiss product, and transport. The president of the Lindt Chocolate Competence Foundation, Ernst Tanner, sees the project as a priority: "Switzerland's chocolate industry plays a key role in the national and international perception of Swissness. In order to develop and communicate the good name of Swiss chocolate, as well as the knowledge and skills in relation to the provenance of the raw materials and the manufacture of the product, the Foundation plays an active role in securing the long-term viability of Switzerland as a centre of chocolate excellence." Alongside existing target audiences, the Swiss Museum of Transport is increasingly keen to address foreign visitors. "This strategic partnership supports the Museum's desire to focus more strongly on the transportation of goods and thus illustrate the significance of transport. It also helps us address tourist audiences with a typical Swiss product," says Martin Bütikofer, director of the Museum. The Swiss Chocolate Adventure is a multimedia experience that connects visitors in a compelling way with the discovery, provenance, manufacture and transport of chocolate. The display area covers 700 m2. Each of the ten wagons can accommodate six visitors. The journey takes 25 minutes to complete. The attraction can be experienced in German, French, Italian, English, Spanish and Mandarin. Basel-based media specialist iart ag was responsible for the overall realisation of the project (concept, media and lighting planning, ride planning). Stuttgart-based Atelier Brückner provided the content, scenography and exhibition design. We publish important corporate information on a regular basis.